By now Nokia’s commitment to the Windows Phone OS should be well established. What has made their role so vital to Microsoft is not just the hardware they’ve created (4 phones in 12 months) but the support they’re providing to the platform from all directions. Whether it’s original OEM apps, exclusive titles, developer support tools, mapping data, dispersing thousands of free Lumias to devs or their promotions, Nokia has gone beyond their competitors in many ways. One of those is one that may not be too familiar with Windows Phone Central readers but is just as impressive: Nokia’s SmartStart program. When a customer buys a new smartphone presumably they have many questions. In fact we take it for granted that people will just “figure out” how to get their phones setup, know what Live ID is, how Facebook Chat works, etc. In reality though, Nokia is assuming that many people who buy the Lumia 710 (T-Mobile) or Luima 900 (AT&T) are new to the smartphone world and will need help. The question is who will help them? The carrier? Online support? Friends? To answer that question, Nokia decided to setup their own help center but there’s a twist: you don’t call them, they call you. That’s SmartStart. When a customer buys a Nokia phone, ideally the service rep at the store will tell them about the SmartStart program or they can find material referencing it in the phone’s packaging. From there, the customer can go to Nokia’s website (https://setup.nokiausa.com/) and schedule a free session with a trained rep. The scheduling allows Nokia to call the customer at their convenience and focus only on what they want to talk about. For instance, say you want to learn how to do setup email or you’re concerned with productivity—from the site you can select those topics and the Nokia representative will then be prepared to walk you through the setup and usage of your phone. It’s free, session time is unlimited and you can schedule multiple sessions (should you have more questions later on). So why is this a good thing? The ability to control one’s message is key and having properly trained support staff is important to that goal. Though AT&T and T-Mobile staff may know a bit about Windows Phone, as our audience can attest, knowledge and service varies from person to person. By going this route, Nokia can control how information is presented, accuracy and customer satisfaction. It also takes away work from the carriers, saving them time and money. Think about that for a second: Nokia has gone to T-Mobile and AT&T and basically told them “we’ll handle product support for our devices, don’t worry about it”. It’s no wonder the carriers have been a fan of the program as it lightens their load. In fact, we’re told that the carriers are starting to schedule these SmartStart sessions for you over the phone should you call them first, weaving a nice support system together. From survey data collected after SmartStart sessions, users gave the program an 86% average satisfaction rating. In scoring on specific categories from 1 to 5, users gave an satisfaction average of 4.6 which strongly suggests that customers are really enjoying the help from Nokia. The program launched in the US with T-Mobile and then AT&T but has since expanded both in language support (they’ve added Spanish) and regions (Mexico and Canada both offer the program now too). The goal though is to global with the service and Nokia is fine tuning the program and learning from the US market on how best to do that. Though users can call or use the web service to schedule a SmartStart session, it makes sense to have an app to facilitate the process. We’ve learned that in about one month’s time, we can expect an official SmartStart app in the Nokia Collection market to fulfill that role. 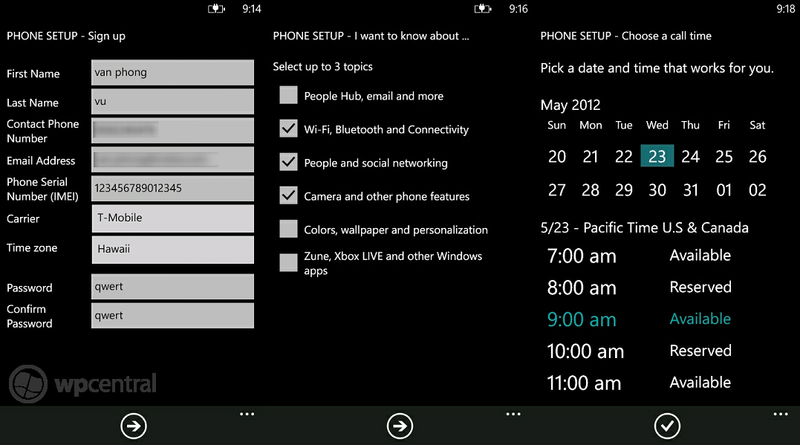 The app is a simple scheduler as you can see from our screenshots above. You pick the time, phone number to be called at and topics you want to talk about and the information is then sent to Nokia. Eventually, Nokia would like to have this app “baked” into the ROM so users won’t have to download it separately. 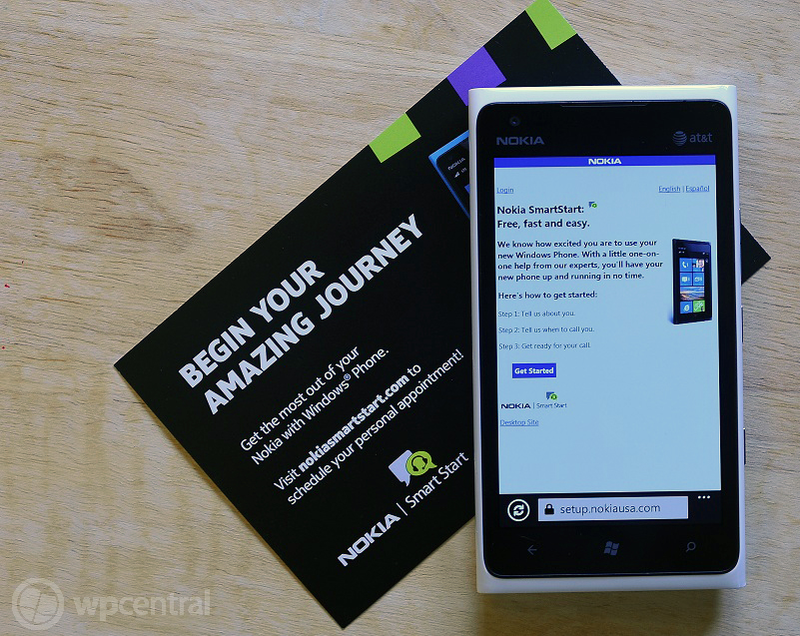 Though many users on this site are more than familiar with smartphones and Windows Phone 7, Nokia’s SmartStart program seems like a brilliant strategy: it saves the carriers money and takes some of their work away, it keeps customers happy by making sure they understand their phone and it’s good for Nokia since their competition doesn’t offer anything comparable. In short, it’s yet another unique service and support structure that Nokia offers, making them a “premium” Windows Phone partner akin to how Apple supports their products via their “Genius bar”. Will it win over converts and make the difference in the long run? It’s too early to tell but from our glimpse behind the curtain, we would much rather have Nokia offering this program than not.